As Kosovo and Serbia offer conflicting interpretations of the the 2011 Freedom of Movement Agreement, holders of Serbian documents issued for Kosovo residents are hindered from traveling freely. This May, Kosovo Police at the Kosovo-Macedonian border told Sofija [an alias] that Serbian Koordinaciona Uprava (Coordination Directorate) passports issued in Belgrade are no longer recognized as valid travel documents. At that moment, Sofija was in possession of three documents: her Coordination Directorate passport, her Serbian ID card with Kosovo residence, and an old non-biometric Kosovo ID card, and none of them could get her through to Macedonia. Crestfallen, she turned back. Sofija became worried, as she was meant to travel to Ljubljana at the beginning of June from the Prishtina airport, and her Schengen visa was in her Coordination Directorate passport. Until March, which was the last time she traveled, Sofija had no problem using the same passport to travel from the Prishtina airport to EU countries, and its validity was never questioned before. To double check, she called the Kosovo Ministry of Interior. She was told that she should have a Kosovo-issued passport with her, but that she should also bring her Serbian passport with the Schengen visa. The woman she spoke to from the Ministry was pleasant and spoke Serbian, she said. She paid 80 euros for an expedited Kosovo passport and managed to travel to Ljubljana without further hassle. Sofija is one of dozens of other Kosovo residents who have recently reported problems crossing the border with Serbian passports and IDs. However, unlike Sofija, other Kosovo Serbs are coming up against a wall when trying to attain Kosovo citizenship documents. Kosovo and Serbia have a history of technical barriers to free movement (regarding Kosovo document holders, drivers licenses, and international travelers). But the ban on Coordination Directorate passports and Serbian IDs issued to Kosovo residents–though it also affects members of other communities–overwhelmingly impacts Kosovo Serbs. Inconsistent implementation, poor communication between authorities and the public, and bureaucratic barriers surrounding the application process for Kosovo-administered documents is adding to the confusion and chaos for Kosovo Serbs traveling in and out of Kosovo. 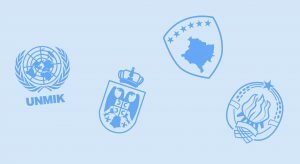 Kosovo Minister for Dialogue Edita Tahiri announced last year that holders of personal identity cards issued by Serbia for for localities that are physically in Kosovo would be prohibited from entering or leaving Kosovo by April 2016. In May, B92 and Radio Free Europe reported that the Kosovo government informed tourist agencies and transportation companies that Coordination Directorate passports are considered illegal. In late June, Milan Radojevic, the Kosovo Deputy Minister of Internal Affairs, claimed that that this was not part of the freedom of movement agreement. He said that there has only been a non-formal instruction to the directorate of Kosovo border police not to allow passengers with documents issued by Serbia for localities in Kosovo to enter or exit Kosovo. Holders of Serbian ID cards with Kosovo residency and Coordination Directorate passports have reported that they were prevented from crossing at various Kosovo border points and at the Prishtina airport in recent months. According to Radojevic, the majority of citizens have been returned from crossings Dheu i Bardhe/Konculj, Han i Elezit, and Merdare. To add to the confusion, people also reported to have managed to use the disputed passports to either cross the border or check into the Prishtina International Airport with a warning. For example, a civil society activist boarded a plane for Brussels on June 19 with a Police Directorate Kosovska Mitrovica passport, and a student from Zubin Potok crossed the Brnjak crossing with a Coordination Directorate passport in late May. Yet, despite people reporting that the documents they used to use freely have been rejected at border points only recently, the Kosovo government maintains that these documents were always considered illegal. Serbia has three different types of passports. There are passports issued to Serbian citizens residing in Serbia, which have been included in the Schengen zone’s visa free regime since 2009. These passports are recognized worldwide, including in Kosovo. Then there are passports issued before 2009 to Serbian citizens residing in Kosovo, which are also included in the visa-free regime and recognized anywhere in the world except Kosovo (these passports are also known as Police Directorate passports). The third type of passports are those issued to Serbian citizens residing in Kosovo after 2009, which are not included in the visa-free regime but have been accepted as travel documents around the world. These are also known as Coordination Directorate passports. In turn, Serbia’s Ministry of Interior established the Belgrade-based Coordination Directorate in August 2009. The directorate is in charge of issuing passports to citizens of Serbia who reside in Kosovo, and according to the Serbian Ministry of Interior, it has issued a total of 97,809 passports between 2009 and 2016. Dren Zeka, Chief Advisor to Minister Tahiri, claims that Kosovo has never recognized these passports. In 2011, Kosovo and Serbia reached the Brussels-negotiated Agreement on Freedom of Movement to allow citizens to pass freely through the respective territories. The agreement, which was not fully implemented until May 2013, calls for each party to establish an “ID system for cross-border/boundary travel for residents from the other party.” With this agreement, Kosovo document holders could travel to Serbia without a special permit for the first time since 1999. Daut Hoxha from the Kosovo Police’s Information Office said that Kosovo has not accepted documents administered by the Serbian Coordination Directorate since November 2011, when the ‘protocol’ between Kosovo and Serbia entered into force. Borko Stefanovic, the Serbian representative during the 2011 freedom of movement negotiations, disagrees. Stefanovic told Prishtina Insight that the exchange of document ‘samples’ was solely a technical process for parties to “familiarize” each other with their documents, which did not include an agreement on which documents would be accepted. “There are only protocols, meaning implementation teams, who showed the other side how ID cards, birth certificates, et cetera look like. That was part of the technical implementation of the agreement on freedom of movement. But there is not an additional agreement… The question of passports was never the subject of the negotiations,” Stefanovic said. In a statement to Prishtina Insight, the Serbian Office for Kosovo and Metohija also emphasized that the validity of Serbian ID cards and Coordination Directorate passports issued to Kosovo residents were never a part of the negotiations. Meanwhile, for Kosovo residents who have previously used Coordination Directorate passports and ID cards administered in Serbia to cross border points, the rejection of their personal documents feels as though it came out of nowhere. Ljubisa Mijacic, a resident of Zubin Potok, said that the ban has discouraged integration. “The recent ban on the use of ‘illegal’ Serbian documents is another failure that threatens integration. The Serbian community has only the Brnjak gate in Zubin Potok and the Jarinje gate in Leposavic for commuting in and out of Kosovo,” he said. Kosovo’s Law on Citizenship was specifically designed to be de-ethnicized and allow for equal citizenship pathways to minorities and the diaspora. Article 3 of the Law on Citizenship states that all citizens of Kosovo may have multiple citizenships. In practice, this means that persons with multiple citizenships (for example, German, Serbian, French, Albanian, et cetera) do not need to forfeit their Kosovo citizenship. But the situation is trickier for Serbian citizens who are residents of Kosovo, because Serbia maintains that Kosovo is an integral part of Serbia and issues documents with residencies in Kosovo towns through institutions that are geared to provide services only for Kosovo residents. Though Serbian documents for Kosovo residents are not issued on Kosovo’s territory–passports are issued in Belgrade, and drivers licenses and ID cards are issued in Raska by displaced Police Directorates–the Kosovo government considers the institutions and the documents as “parallel” and illegal. Critics say that Kosovo’s ban on coordination directorate documents is unjustified and a violation of Kosovo’s Law on Citizenship. “The intention of Kosovo Government to outlaw the personal documents issued by Serbian authorities appears as attempt of bureaucratic subjugation of the Serbian community. The problem is far too sensitive for such a robust and exclusive solution,” Miodrag Marinkovic, program director of NGO AKTIV, said. In theory, Kosovo law enables all pre-war residents of Kosovo who were Yugoslav citizens, as well as all persons who habitually resided in Kosovo during UNMIK administration, a pathway to Kosovo citizenship. Yet Kosovo Serbs have long been reporting bureaucratic barriers to attaining Kosovo documentation, from lacking old paperwork to Kosovo not recognizing Serbian-administered marriage certificates. Naim Rashiti, Executive Director of the Balkans Policy Research Group, said that it is the institutions rather than the people’s will that is the biggest barrier to integration. For individuals with access, many choose to attain residency in ‘Serbia proper,’ thus foregoing the whole mess and also enjoying the benefits of visa-free travel. Meanwhile, those with less privilege continue to trudge through institutional backwater, trying to overcome barriers to obtaining citizenship rights by both Kosovo and Serbia. Rashiti said that the situation on the ground will not change until Serbia and Kosovo work out a way to recognize each other’s marriage, residency, and other civil documents. “Until they recognize each other’s jurisdictions, there will be no benefits for the citizens. And this will continue. Serbia and Kosovo not recognizing each other’s civil law has complicated things for citizens of both countries,” he said. This is part one of a two-part investigation on the implementation of Brussels-negotiated agreements and how it affects people on the ground. Correction: an earlier version of this article misattributed a quote; the article has been updated.